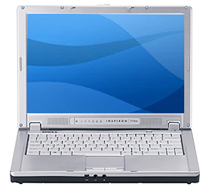 Dell Inspiron 710m is a ultra-portable, thin and light notebook computer from Dell, which is a little enhancement over its predecessor Dell Inspiron 700m. Dell Inspiron 710m features 12.1″ WXGA LCD Display (1280×800), Intel Pentium M Processor, PC2700 RAM, CD/DVD Dual Layer +/- Recorder, integrated Wireless LAN (Wi-Fi), 56Kbps modem, Ethernet, S-Video out, four-pin FireWire, USB 2.0, headphone port, microphone port, and one Type II PC Card slot , plus an extended battery. NotebookReview reviewed Dell Inspiron 710m and concluded that “overall, I’m very pleased with the choice that I’ve made. To be honest, I almost returned it twice – once when I heard about the launch of Dell’s XPS M1210, and again when the MacBook was launched. I’m glad I decided to keep it, as the MacBook seems to be having a number of issues with heat and I wouldn’t be surprised if both fall short in terms of battery life.